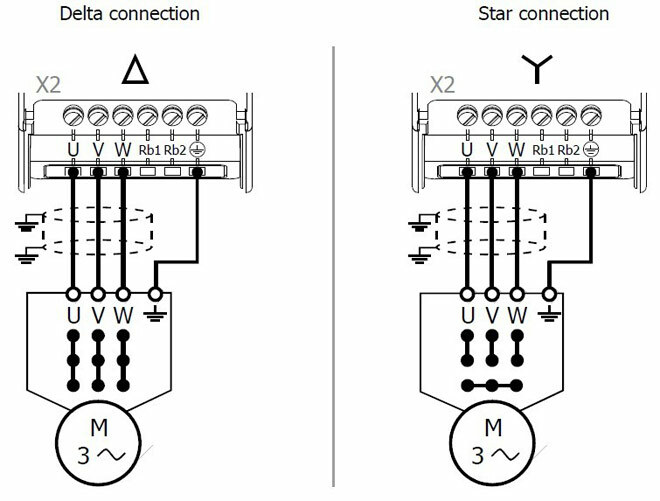 Connect in delta connection or star connection according to the motor data. The specified lengths of the variable frequency drive cables must not be exceeded if no output filter is installed. Longer variable frequency drive cables can be used after taking appropriate measures, e.g. use of low-capacitance cables and output filters. The following table contains recommended values for the use of output filters. In the case of variable frequency drive cable lengths exceeding 300 m, contact the VFD manufacturers service. In the case of a group VFD (several motors at one variable frequency drive), the total length must be divided across the individual motors according to the value given in the table. Use a thermal monitoring element on each motor (e.g. PTC resistor) in order to avoid damage. A group VFD with synchronous server motors is not possible. Gozuk recommends installing a brake resistor to the variable frequency drive if feedback of generator energy is expected. Overvoltage shutdowns can be avoided by this. During operation, the surface of the brake resistor can reach high temperatures. The surface can keep high temperatures after operation for a certain time. Do not touch the brake resistor during operation or operational readiness of the variable frequency drive. Noncompliance may result in skin burn. Install a safeguard for protection against contact or fix warning labels. Do not install the brake resistor in the proximity to flammable or heat-sensitive materials. Do not cover the brake resistor. Gozuk recommends using a temperature switch. The brake resistors available from Gozuk in resistor size 4 (92 Ohm, 696 W continuous power) and above are equipped with a temperature switch by standard. In resistor sizes 2 and 3 (300 Ohm, 213 W and 136 Ohm, 471 W) the temperature switch is available optional. The temperature switch disconnects the variable frequency drive from mains supply if the brake resistor is overloaded. Using Brake resistors without temperature switches can result in critical states. DC-connection requires a power estimation of the complete system. The brake resistor is operational dependent on the enable of the variable frequency drive. 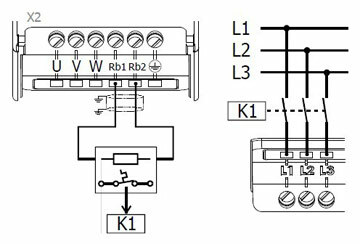 The contactor K1 must disconnect all plant components from the mains.